ST. PETER, Minn. – The Gustavus volleyball team hosted a quadrangular Saturday and came out with a pair of victories against the University of Wisconsin-Stout and Luther College. The Gusties beat the Blue Devils 3-2 in comeback fashion and shutout the Norse 3-0 to improve to 9-2 overall. Gustavus also increases its win streak to nine, which is the longest since an 11-game streak in 2008. 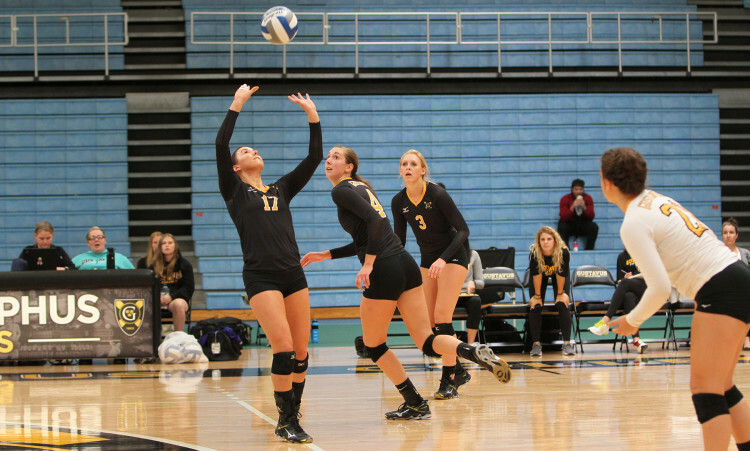 The Gusties won by set scores of 25-18, 21-25, 24-26, 25-11 and 15-10 to claim their eighth consecutive victory. The first set started out with a couple lead changes, but the second change was in favor of the Gusties at 4-3 and they never trailed rest of the way. UW-Stout was able to tie the score twice at 11 and 13, but the Black and Gold finished the set on a 12-5 run to close it out. Gustavus posted a .257 attack percentage in the first set, while the Blue Devils hit at a .068 rate. The second set provided a few momentum swings. UW-Stout started the set with a 10-5 lead, forcing a Gustavus timeout. The Gusties came out of the break and found a rhythm on offense by going on a 10-3 run for a 15-13 advantage. The two squads battled back and forth over the next 10 volleys for a 19-19 score. Gustavus took the next point for a 20-19 lead, but the Blue Devils answered with five consecutive points en route a four-point win. Gustavus took control early in the third set with a quick 3-0 lead, but UW-Stout slowly chipped away and eventually tied the score at 10-10. From that point on there were 11 ties and five lead changes, the last of which was a 23-22 lead change in favor of UW-Stout. The Gusties tied it up at 24-24, but the Blue Devils closed out the set on a pair of kills. The Black and Gold came out firing in the fourth set and claimed the first eight points, highlighted by three Alyssa Taylor (Sr., Trimont, Minn.) blocks. UW-Stout was never able make a run of more than two consecutive points until the end of the set, but it was too late as the Gusties cruised to a 14-point win to force a deciding fifth set. Gustavus posted a match-high .485 attack percentage in the fourth, while holding the Blue Devils to a .094 mark. Gustavus carried its momentum into the fifth and jumped out to a 7-2 lead. The Blue Devils battled back to within one point at 10-9 and forced a Gustie timeout. After the break, Taylor Trautman (Jr., Hutchinson, Minn.) gave the Gusties a big boost with a hard-hitting kill down the middle and from there out it was all Gustavus. Brittany Luethmers (Fy., Prior Lake, Minn.) posted back-to-back service aces and the Black and Gold closed out the match on kills from Taylor and Lauren Hanson (Fy., Redwood Falls, Minn.). Hanson paced the Gustie offense, going 16-for-36 on the attack with four errors for a .333 percentage. Taylor and Anne Ladwig (So., Albert Lea, Minn.) also tallied double digit kills with 11 apiece. Taylor added a match-high seven blocks. Nora Holtan (Fy., Rochester, Minn.) dished out 39 assists, while Luethmers controlled the back line with a match-high 28 digs. The Gusties won in straight sets by scores of 25-13, 25-16 and 25-22 to increase their win streak to nine. In the first set, Gustavus scored the first three points and never relinquished the lead. The closest Luther came was a one-point deficit on three different occasions early in the set, but the Gusties went on a 5-1 run midway through the set to take a 12-7 advantage. Gustavus ended the set on a 6-1 run for a decisive 12-point win. Luther responded with a 3-1 lead early in the second set, but the Black and Gold came back with a 9-1 run to take a 10-4 lead and force a Luther timeout. The Gusties continued to add to their lead the rest of the set and finished with another convincing win – this time by nine points. The third set was much more closely contested early on, leading to a 7-7 tie, but the Gusties once again found their rhythm on offense with an 11-4 run to take an 18-11 advantage. The Norse made it interesting by responding with an 11-5 run of the their own to cut the deficit to 23-22, but Gustavus ended the set and the match on kills by Trautman and Sarah Schuetz (Sr., Eagan, Minn.). Offensively, Gustavus posted an impressive .374 attack percentage, while holding the Norse to a .102 mark. The attack was led by Kelle Nett (Sr., Spring Valley, Ill.) with eight kills on 12 attempts and no errors for a .667 hitting percentage. Holtan posted 20 assists and Luethmers tallied 16 digs to lead the Gusties in those respective categories. The Gusties return to Minnesota Intercollegiate Athletic Conference play when they host St. Olaf College at 7 p.m. on Sept. 23.